It's interesting. It seems to be aimed at people who go outside, have friends and are happy. I do one of those things. Can I still buy a Nintendo Switch? 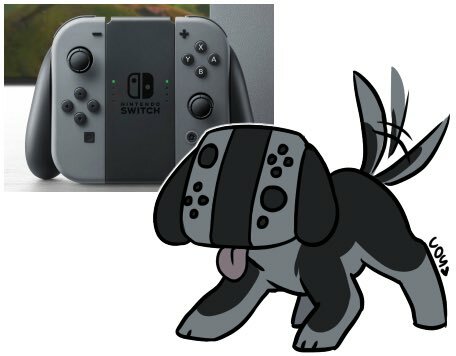 I'm a Switch for Nintendo! It's a Nintendo console, so I'll buy it once there's a cool game for it I can't get on Wii U.
I've noticed that there is an odd tendency in this forum to post rapid reactions without consideration to anyone who might have opened the thread before reading the news story. Let us give our condolences to our dearly departed 2 screened EO games. You lived a long healthy life and may you live on as a single screen entity if your existence were to continue. We all will remember you dearly. How long until I can play Smash Bros on it. I really liked what I saw in that reveal video (new 3D Mario game! ), although with a few caveats. The modular controllers look fun and well-designed, and the ability to split them up for multiplayer games on the go is genius. I hope and expect that Nintendo will offer a few variants on those things, to give retro gamers a proper d-pad to work with if they want one. The name is good! And I'm happy with the form factor, since I always travel with a bag and I'll be glad to have the larger screen. Seriously, you can cram a Vita or a 3DS XL into your pants pocket if you try hard enough, but no one should. The two things that disappointed me slightly in that video were the apparent lack of touchscreen on the tablet and the total lack of 2-screen gameplay (which seems like it would be impossible, based on the design of the dock). That dashes my hopes of them directly porting over the best Wii U games, or of having DS and 3DS Virtual Console games on the Switch. Then again, I wouldn't be surprised if they do ports of their first-party games just to bolster the software library. But what is Mario Maker 2 going to be like if you don't have a touch-screen for level construction? Whether or not I get one of these is going to depend on a few things, but it mostly comes down to price, which games are available (I didn't buy a Wii U and I'm hoping stuff like Mario 3D World gets ported to the Switch) and whether they finally come up with a unified account system. If I can bring over my Wii and 3DS Virtual Console games, then I'll be sold pretty much day one. But if it's yet another isolated platform and I have to rebuy everything...well, I might just wait to see how things play out. Apple, Sony and Microsoft have all made huge strides in letting you play your games across multiple consoles, it's time for Nintendo to join them in the modern era of accounts and cloud saves. I can't imagine a universe where this doesn't have touch screen support. That's what I'm thinking, though it did make me nervous not to see it in the video anywhere. I hope there's a direct soon. Anyway, really excited about this console otherwise. I wonder if Nintendo specifically decided not to show touchscreen support because it doesn't want to remind people of the Wii U. Odd, I think, but, eh, marketing people. Did anyone notice a stylus somewhere on the controller? That would be key and consistent with a Nintendo touch device, I'd think. Touch screen and gyro controls are stupid cheap to put in and are the foundation of many (or most) android games; I cannot imagine them NOT putting in either of those even less both. I would suggest finding the stylus on the system from the video but it is likely they (listened to the complainers who didn't buy their touch systems and) switched to a capacitive screen. I really, really need to know if this is going to be region locked. According to Emily Rogers, it's region free. The science looks TIGHT, but can I play Splatoon: Switch Edition with one of my sons, without buying TWO of these adorable robot puppies? Yeah one thing about touch screen support is that it doesn't appear to have a way to use the touch screen while docked.. so, who knows. Who is Emily Rogers? Does she work for Nintendo? The Switch logo kinda reminds me of the face of the robots from Laputa: Castle In The Sky. Last edited by sfried; 10-20-2016 at 10:48 AM. It not being pocket-sized only matters if they're going to try to include 3DS-like incentives to carry it everywhere. Even though streetpass never happens in practice, I still bring my 3DS with me whenever I go out just because the pedometer function rewards me. They will probably end up with less, or different, OS-level gamification. She usually knows what's up. She's a freelance games journalist. Other people are saying it too. Just wait for confirmation I guess. If Nintendo can get about half of those games in the trailer out in the launch window they should be in a good place.